Around the country labor activists, transit advocates, and environmental advocates are coming together to stand up for public transit as a civil right, and as necessary for a sustainable, environmentally just future. Organizers picked Rosa Parks’ birthday to talk about transit equity. “We want to make the connection to [her] act of resistance to highlight the rights of all people to high-quality public transportation,” said Leon Guerrero, Executive Director of the Labor Network for Sustainability. Public transit is facing many challenges around the country — from decreased funding, to privatization, to competition with new transportation options. Almost half the country’s population doesn’t have access to public transit. Here in the Bay Area we have our major challenges. Road congestion is breaking new records every year. Folks are being priced out of centrally located housing, which creates longer and longer commutes. Our population is only increasing, and while we need to build a lot more (and denser) housing to accommodate everyone, we urgently need a much bigger commitment to expanding public transit infrastructure so that people can access employment and all the amenities and opportunities the region has to offer. Too many neighborhoods are still relative transit deserts, where frequent, reliable, accessible service does not exist. People are cut off from opportunity or forced to spend way too much time in and money on single-occupancy vehicles. Public transit is of course also a climate justice issue. We need to drastically reduce emissions, giving us cleaner air to breath and putting the brakes on climate change to the extent possible. 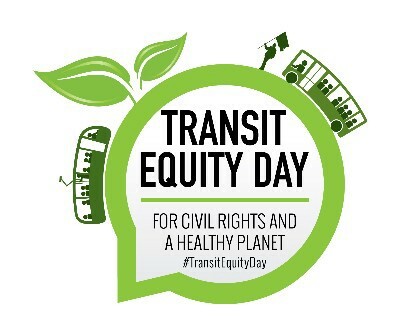 We’re inspired to hear about the #TransitEquityDay actions going on around the country — in Portland, Buffalo, Atlanta, Los Angeles, Washington D.C., Berkeley, Denver, Jersey City, Nashville, New Haven, Orlando, Pittsburgh, Santa Fe, and Tucson. Groups are addressing a wide range of equity issues. They’re taking action to lower prohibitively steep fares and restore service. They’re speaking out about what safety really means, and denouncing disproportionate citations against people of color for “behavior code” violations. They’re working to register voters, increase ridership, and implement electrification to address climate goals. They’re even fighting for the rights of the workers who bring us transit service to unionize, to make a living wage, and to be treated with respect. We look forward to building more pro-transit alliances across issues of civil rights, environmental justice, and equal opportunity. We’ll only get there together.